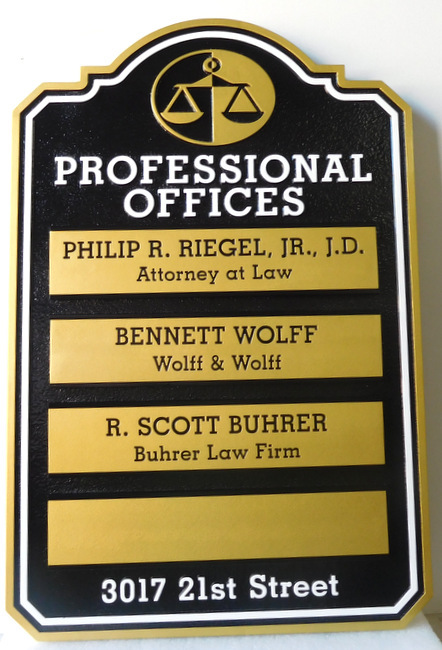 This attractive Professional Offices Directory sign for 4 law offices is carved from HDU, with a smooth background and raised text, border and scales-of-justice/ The nameplates are engraved smooth-faced HDU, and are readily removable/replaceable. Art SignWorks guarantees to supply matching custom nameplates for future additions/changes. The sign is painted black and metallic gold, and is clear-coated twice.